There's nothing like being on a swing or hammock to really ease the knots in your body and mind away. 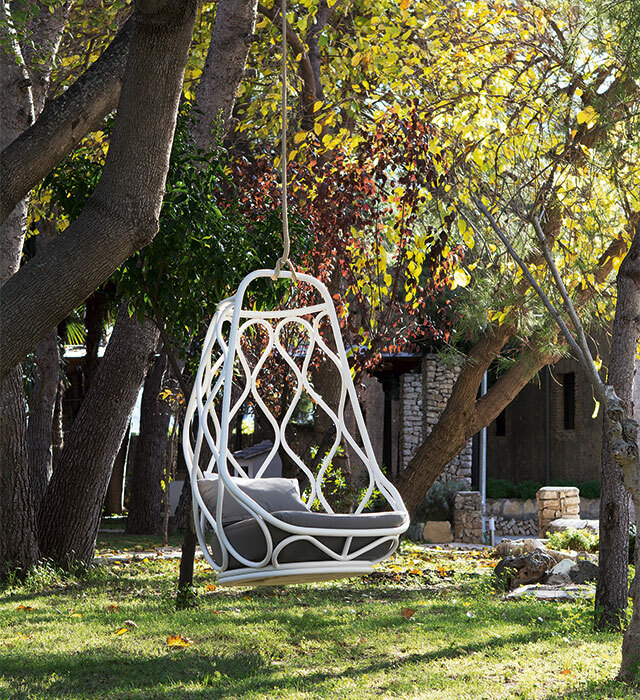 Perhaps it's all that gentle swaying and the mild breeze that comes with it - not to mention, the play of light and shadow if you're on Nautica, a hanging chair by Expormim. Originally a design from the '70s, it's been redesigned by Alberto Sánchez from MUT Design. 100% made from peeled and tinted natural, it's held up by a polyester rope. Specially crafted for the outdoors, one half of the Twins armchairs is its masculine counterpart, featuring a higher back support for you to sink in. 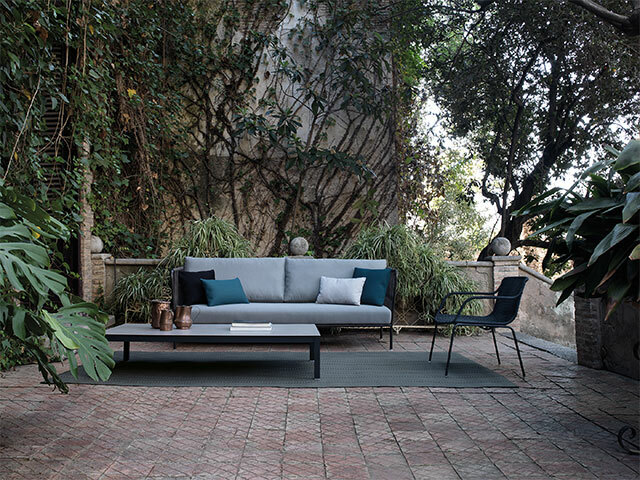 Outdoor furniture doesn't always have to take a robust and hardy stance — you can feel very much at home both outside and inside thanks to the chair's unique technical fabrics. 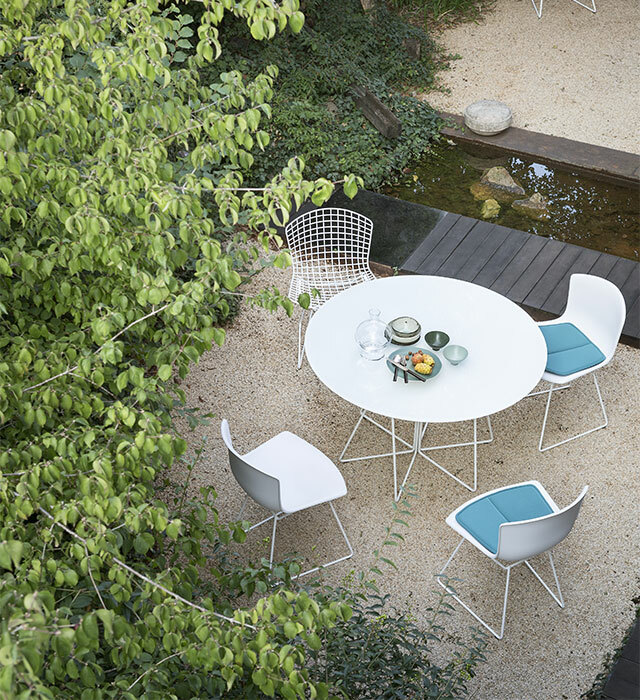 Originally designed by Harry Bertoia, the classic side chair is given an outdoorsy boost. Now available in white, black and gray, its metal structure is painted in white or black. Other upgrades? The seat is more comfortable, adaptable to both residential or contract clients. A breathable and waterproof cushion — a staple for backyard furnishings — now comes in six different colours, making them excellent seating solutions for feasting. The Lapala collection is your answer to a Mediterranean way of life — in furnishings, at least. Braided chairs typical to the locale have been updated to become a modern classic by Expormim, who has added gentle curves and made the chairs stackable for easy storage. Add texture and variation to your lounge area by varying hues of the same colour, as seen below. 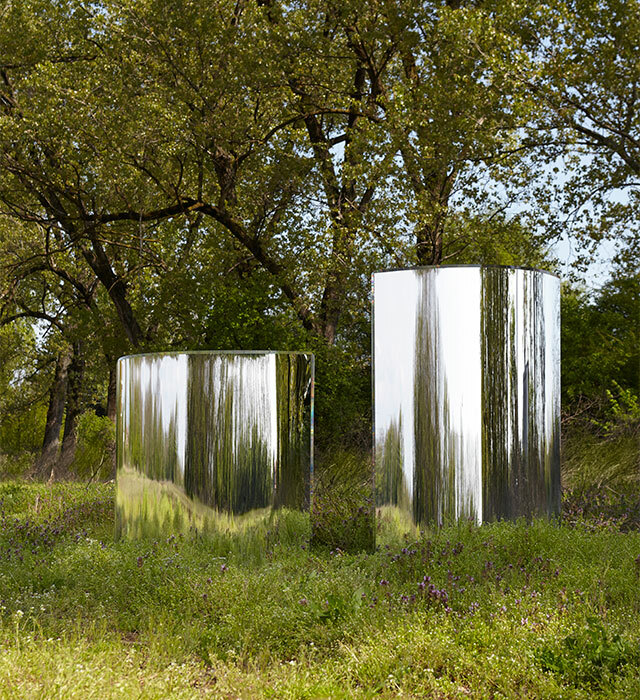 For something that will really transform your space, Glas Italia's new Prism partitions reflect your surroundings wherever you place them. If you've strategically planted them onto your garden, it'll maximise the space in both a functional and aesthetically pleasing way. Live the lush life with these hand-curved and silvered glass screens, with its smooth corners and transparent edges that really trick the eye.